Nicholas Roerich was a spiritually inspired artist whose visionary paintings depict vistas beyond our usual perception of human reality. Roerich’s paintings are alive with the color and light of other worldly realms allowing us to encounter visually that which we may have imagined, grasped, or somehow inherently recognize as the spiritual essence behind the veil of our unseeing eyes; Roerich’s paintings seem intent to inspire, educate and reveal the glorious mysteries of the ancient wisdoms in the landscapes of our souls. Tempera on canvas. Private assembly, USA. Nicholas Roerich was born October 9, 1874, in St. Petersburg, Russia. His father was a liberal-minded and well-respected lawyer whose many friends included scientists, scholars, and artists. These family friends would often visit the Roerich household and would engage in lively discussions that left an impression on young Nicholas. Roerich’s grandfather, Fyodor Ivanovich Roerich also lived with the family until his death at 105; he had a large collection of Masonic symbols that fascinated Nicholas and his brothers, and these too left an impression on Nicholas that would later be revealed through his life’s work. Nicholas Roerich had a happy and stimulating childhood in both the urban culture of St. Petersburg, as well as the natural beauty of the rural countryside. 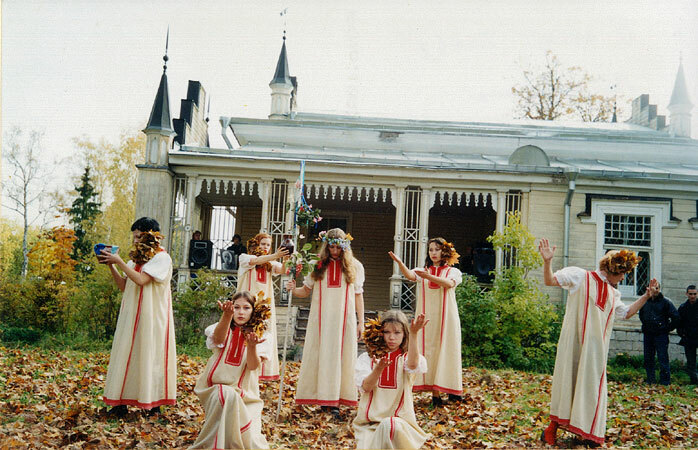 In 1872, Nicholas’s father purchased a 3000-acre estate, Isvara, outside of St. Petersburg. Isvara was a magical place for Nicholas, who spent many happy summers exploring the vast wilderness around the estate and gaining a deep love and respect for nature. Nicholas loved to lie in the grassy fields at Isvara and look up at the clouds, seeing fantastic pictures appearing across the sky. He would also spend lovely hours in the evening, curled up in a chair reading books about faraway lands and imagining what those places were like. A family friend who was an archaeologist used to take Nicholas on digs near the estate and through these experiences, Nicholas developed a great love for archaeology and discovering hidden treasures of the world. It was also at Isvara that Nicholas became fascinated with a painting that hung in the living room of the estate. The painting was of a huge snow covered mountain illuminated with the setting sun. This mountain was the sacred Himalayan peak, Kanchenjunga, and was prophetic of what were to be great influences in Nicholas’s life: painting and eastern mysticism. As a young man, Nicholas became increasingly interested in drawing and painting and decided that he wanted to pursue an education in art; however his father had his sights set on his son’s following in his footsteps and taking over the family law business. The conflict was solved when Nicholas made a commitment to pursue his education in both law and art. 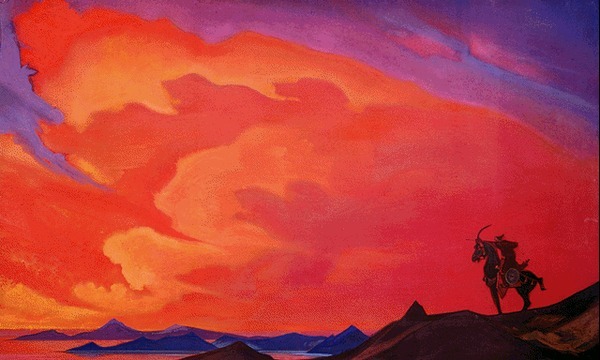 It was perhaps these years of intensive scholarly dedication that gave Nicholas Roerich his ceaseless work ethic and allowed him to accomplish vast achievements throughout his lifetime, which included the completion of more than 7000 paintings from The Messenger: Tribe Against Tribe (1897), his graduation painting, which first gained him notoriety as an artist, to his final work, Command of The Master (1947). 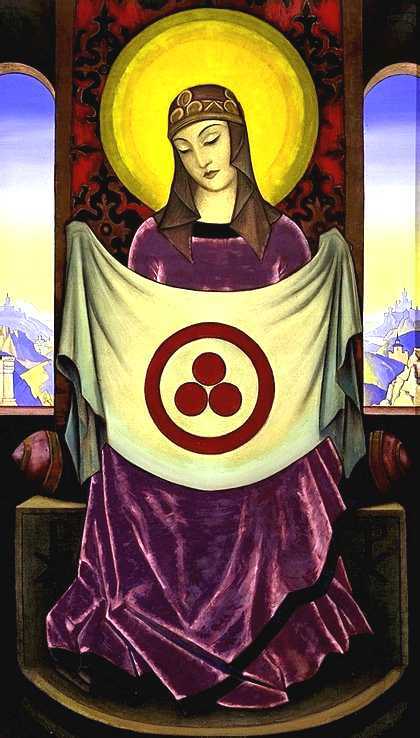 Roerich’s earlier works were influenced by Symbolism, perhaps suggesting his fascination and curiosity as a child with his grandfather’s collection of Masonic symbols. 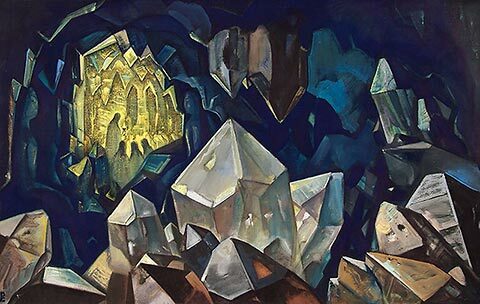 As Roerich’s life became increasingly immersed in the study of Eastern mysticism, Theosophy, and the search for spiritual truth throughout his many journeys, his paintings gave way to a more abstracted approach, much like the processes Kandinsky and other painters experienced as they delved deeper into spirituality. Tempera on canvas. 89 x 137. 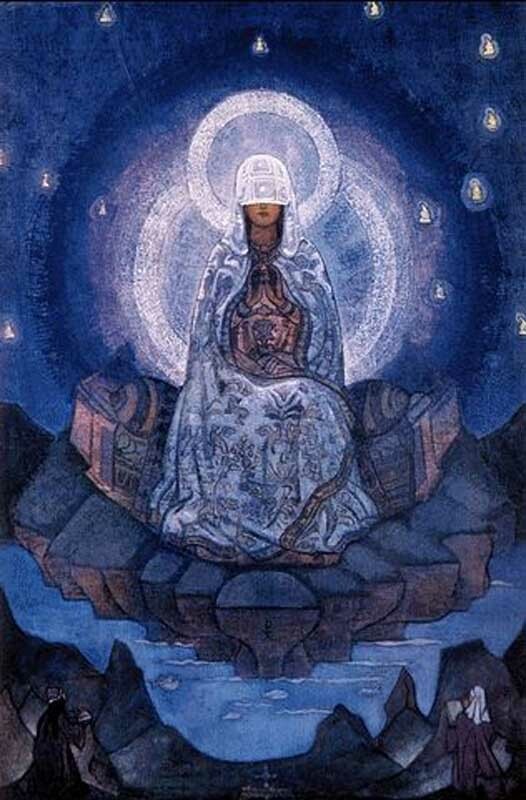 For Roerich, expressing spiritual concepts in his painting required an approach beyond realism, much like the Theosophical teachings of Blavatsky, who claimed that the words of our language are not fully capable of describing the enlightened realms beyond our knowing. 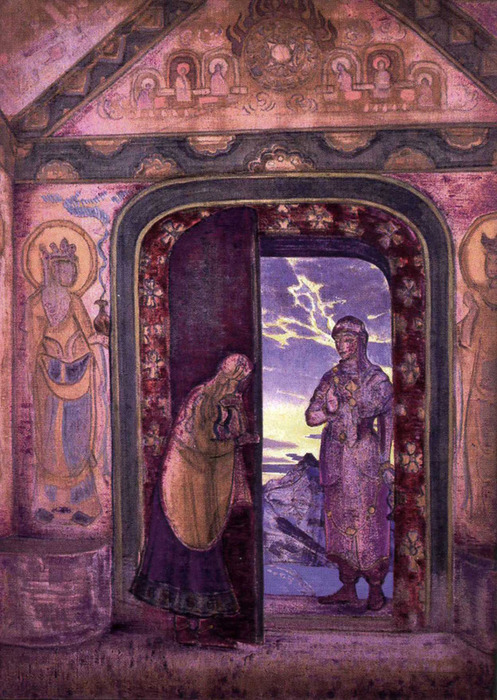 For Roerich, like other spiritually inspired painters such as Wassily Kandinsky and Lawren Harris, the difficulty in expressing “otherworldly” concepts caused him to evolve toward a simplicity in his work that relied more on color, and less on the accurate portrayal of form, to express the imagery of the great spiritual realms that he explored. Tempera on canvas. 51,5 x 76. Nicholas Roerich Museum, New York, USA. As Roerich’s interest in Eastern mysticism and Theosophy grew, it compelled him to embark on a five-year trek through northern India, central Asia, and the Altai Mountains. 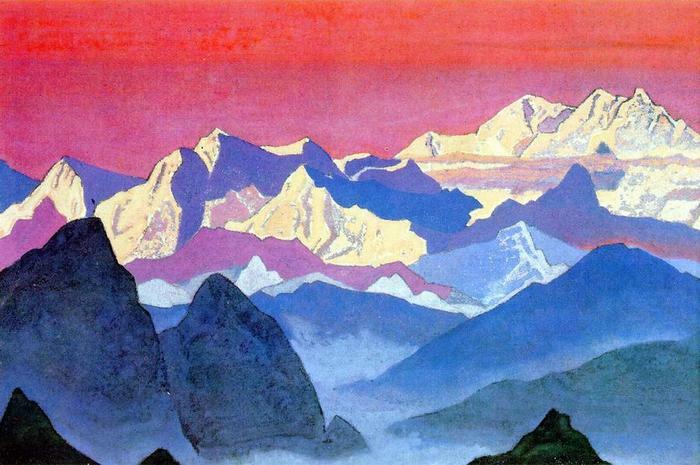 Accompanied by his wife, Helena, and his two sons, Roerich set out to “trace the origins of all Eurasian religious traditions and prove their common source (McCannon, 2000, p. 292)” which Roerich believed was Shambhala, the mystical land hidden in the Himalayas. Roerich documented his travels through the many paintings he completed along the way. These Asian landscapes provided “symbols for his inner visions and spiritual convictions” (McCannon, 2000, p. 271) and these landscapes were an “idealized geographical region [he used] as a prism through which to perceive the spiritual plane he sought in his art” (McCannon, 2000, p. 292). Tempera on canvas. 46,5 x 78,5. Nicholas Roerich Museum, New York, USA. Roerich came to believe, “…that his works portrayed the heavens and earth as they were when human life first sprang into existence. He intended his landscapes to be windows that looked into a bygone realm that suspended between physical reality and an otherworldly anywhere, an arena for vast cosmic struggles, as well as a birthplace for humanity that, in its newness, was bursting with spiritual vitality, freshness and purity” (McCannon, 2000, p. 273). Tempera on canvas. 89 x 117. Private collection, Moscow, Russia. Another powerful result of the Roerich expedition throughout northern India and Tibet, was the discovery of the sacred fire, or Agni Yoga. One evening, while in her tent, Helena Roerich, witnessed a flame that erupted seemingly out of nowhere in front of her eyes. To her amazement, the flame was not hot, merely warm. It was a strange electrical force that occurred high up in the Himalayan Mountains and led the Roerichs to contemplate the great forces of the earth that lay dormant. Agni Yoga became a metaphor for this power, that the Roerichs believed is in us all, and can be developed. Tempera on canvas. 91,8 х 116,9. Museum by name of Nicholas Roerich, ICR, Moscow, Russia. Roerich’s travels also inspired him to establish the Roerich pact, a treaty on preserving and protecting the culture of the world, in both war and peace. His deep appreciation and study of religious and cultural symbols of the world that he infused within many of his paintings led him to believe that it was possible to create peace through art and beauty, and that these symbols, icons of spirituality, needed protecting. Roerich created the Banner of Peace to identify cultural landmarks and stated, “When the whole earth will be covered by the Banner of Peace, protecting cultural treasures, there will be no field for war.” The Roerich Pact was signed in the White House on April 15, 1935, with twenty-one nations of the Americas signing it and has become international law agreed upon by many nations. For his work on this treaty, Roerich was nominated for a Nobel Peace prize. Tempera on canvas. 173,5 x 99,5. Nicholas Roerich spent much of his life seeking hidden treasures within the landscapes of the earth and within his own being. The paintings he left us are the maps to these sacred places and are there for us to use as we seek our own spiritual pathway. Tempera on canvas. 73,5 x 117. Nicholas Roerich Museum, New York, USA. He also left us the teachings of Agni Yoga, a living ethic that is a practical guide to developing awareness of the fiery energy of our hearts and the heart of the universe, through consciously directed thought in our daily lives. 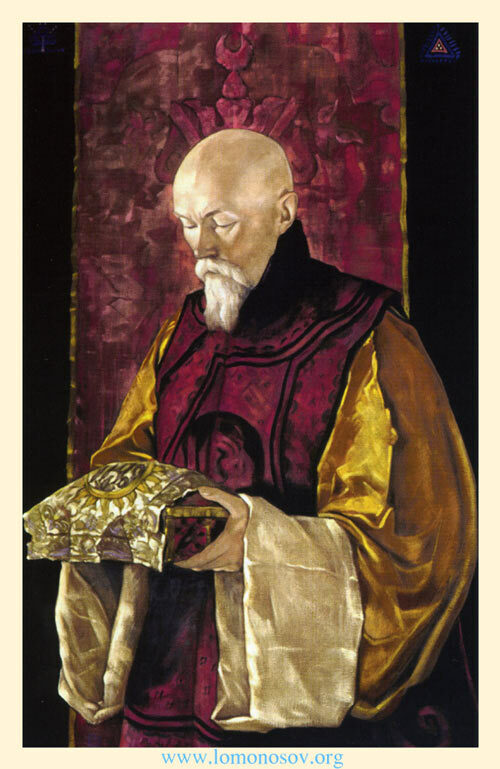 Roerich believed that art and beauty provide a gateway for humanity to enter into higher spiritual realms, and should be created, preserved, and accessible so that all people of the earth can contemplate the higher truths by being given the opportunity to observe the signposts along the path of enlightenment. In 1947, Nicolas Roerich ended his journey on earth and began another perhaps in a realm into which he provided us with insights through his many paintings. He was in a sense a messenger providing for us his works to explore and contemplate; paintings that are rich in color and symbolism, providing us with messages regarding the essence of what he knew and was compelled to share with humanity…the gift of art and beauty; the pathway to the divine. Tempera on canvas. 122 x 91,4. State Museum of Oriental Arts, Moscow, Russia. (London: Thames and Hudson, 1989). John McCannon, In Search of Primeval Russia: Stylistic Evolution in The Landscapes of Nicholas Roerich, 1897-1914, Cultural Geographies 7(3) (2000); 271-297. “Where there is Peace there is Culture; Where there is Culture there is Peace”. “I am prepared for the road. All that was mine I renounced. You will take it, my friends...”.